The Old Orchard nestles in the heart of the countryside yet only 7 miles from Belfast city centre. The accommodation, recently converted to a very high standard (NITB Certified with a 4* rating) sleeps six. There are 3 ensuite bedrooms, a sitting room with television, DVD player, a selection of books and children’s games and a wood burning stove, a large dining room with open fire and a very well equipped kitchen. All fuel for the fires is provided free of charge. A cot and / or highchair is available upon request. Please advise should this be required, at time of booking. There is a wonderfully secluded and quiet patio area with BBQ and seating leading to the garden gate which takes you through to the fields, providing easy walking for all ages. Guests are encouraged to investigate the woodland walks and the Christmas Tree plantations. As we are pet friendly, dogs are very welcome although not in the bedrooms. With 24 acres surrounding the property there is ample space for them to run and to be walked through fields, woodland tracks or just in the enclosed garden/patio area. The owners have an outdoor kennel with run which is available on request. However, prior notice is needed. 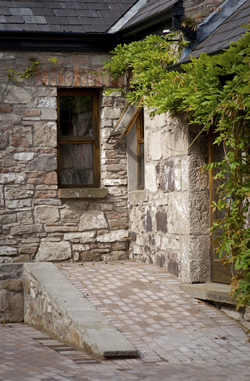 A beautiful shared courtyard leads you to the main entrance of the property which is only 20 metres from the guests’ very secluded & private car parking area. There is space for 2 cars. The property has been designed also with the elderly and the disabled (accompanied by able bodied) in mind, as not only can you access the building via the Kitchen steps, the property can also be accessed via a ramp leading from the courtyard to the double front doors enabling these guests to enter easily. The downstairs has a spacious double bedroom which features an ensuite wetroom shower and contains a bath, a fully equipped kitchen, and a spacious dining room with open fire. All doors are wheelchair & walking frame accessible as are the light switches, door handles & appliance handles. The three bedrooms are all finished to a very high standard and enjoy stunning views across the Craigantlet and Castlereagh Hills and beyond to Scrabo Tower. There is one double bedroom upstairs, one twin bedroom upstairs and as previously stated, one double bedroom downstairs. All bedlinen and towels are supplied free of charge. 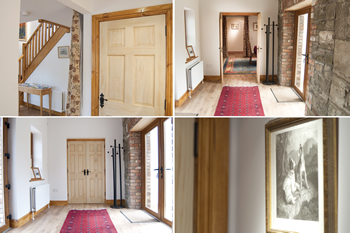 Please take a few moments to browse and explore the links for further details and images of the interior and exterior of the property. We look forward to welcoming you to The Old Orchard in the not too distant future. We had a really lovely time.